← New IHBC Toolbox Research Note on ‘Market Intelligence’ from IHBC’s Jobs etc service: LA conservation jobs update for 2017! 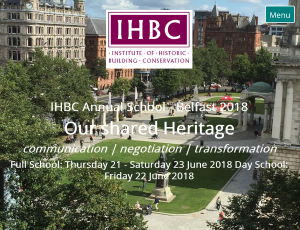 The Day School lead ‘Speakers’ web page for the IHBC’s 2018 School in Belfast – from 21-23 June and exploring ‘Our Shared Heritage’ – has been launched, highlighting speakers and topic areas, so now prospective delegates can see how the School’s theme and topic areas relate to their CPD priorities. IHBC Director Seán O’Reilly said: ‘Our new ‘Speakers’ page offers links to speakers’ online biographies as well as initial CPD reference links to their specialist interest areas. So if anyone wants to get a better idea of why, who and what about our Day School programme, that’s all to hand. We’ll be adding more CPD support as the information comes in, so do keep an eye on our NewsBlogs for updates. All programme details are subject to change.